Crimean Tatars were represented at the wreath-laying ceremony marking the first anniversary of the Victims of Communism Memorial in Washington, DC. U.S. officials and politicians, foreign diplomats as well as representatives of ethnic groups victimized by Communist regimes attended the June 12th event, held at the intersection of Massachusetts and New Jersey Avenues, where the Memorial is located. 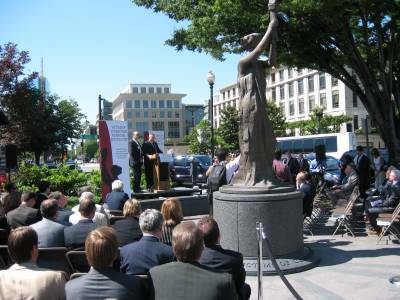 The bronze statue of "Goddess of Democracy" was unveiled a year ago, on 12 June 2007, by the Victims of Communism Memorial Foundation and honors the memory of more than 100 million people who died under Communism. The principal speakers included U.S. Secretary of Commerce Carlos Gutierrez, U.S. House Majority Leader Steny Hoyer and six members of the U.S. Congress. Former California Congressman Tom Lantos (1928-2008) was also awarded posthumously the Truman-Reagan Medal of Freedom. His wife, Annette Lantos accepted the award on his behalf. The event organizers had selected Beethoven's Ninth Symphony as the background music. This well-known symphony is regarded a symbol of both the beginning and the end of Communism in Eastern Europe. In 1918, the top Communist leaders, including Lenin, Stalin and Trotsky, participated in the first anniversary celebrations of the October Revolution by attending a performance at the Bolshoi Theater in Moscow. Seventy-one years later, shortly after the collapse of the Berlin Wall in 1989, the American composer and conductor Leonard Bernstein conducted the Ninth Symphony on Christmas Day in West Berlin. It was very touching to see more than 20 wreaths lined up in the grassy area adjacent to the Memorial site waiting to be presented at the ceremony. They were in alphabetical order, starting with Afghanistan and ending with Ukraine. The wreath-laying ceremony proceeded in steps: the first group of three representatives (Afghanistan, Belarus and Bulgaria) presented their wreaths, followed by a minute of silence. Next were Crimean Tatars, Cuba and the Czech Republic, and so on. Among the Embassies contributing memorial wreaths were: Republics of Hungary, Estonia, Latvia, Lithuania, Poland, Ukraine, Romania, Bulgaria, Slovenia, Macedonia and Georgia. A number of American-based associations of national groups from countries such as Cuba, China, Vietnam, Tibet and Belarus also participated. 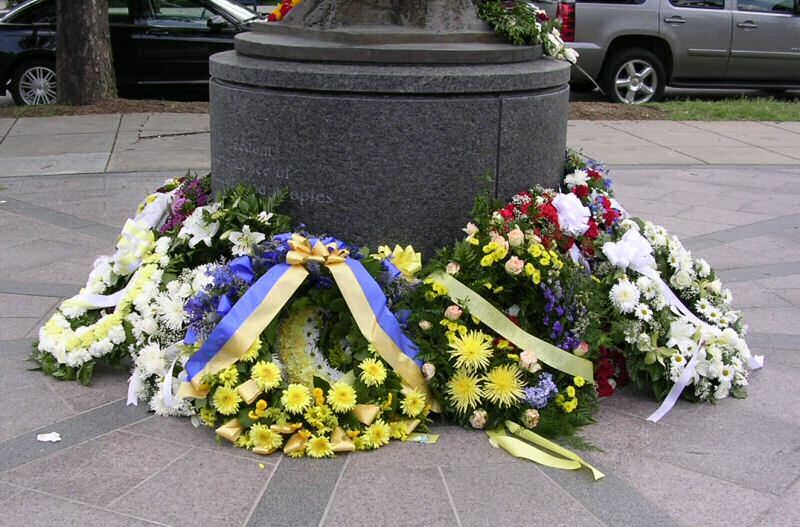 The beautiful wreath honoring the Ukrainian victims was presented by His Excellency Oleh Shamshur, Ukrainian Ambassador. The Crimean Tatar wreath was presented in the name of the Crimean Tatar Mejlis (Assembly), Simferopol, by the International Committee for Crimea (ICC), Washington, DC. The inscription on one of the ribbons read: "Honoring the memory of more than 200,000 victims of famine, deportation and political repression." 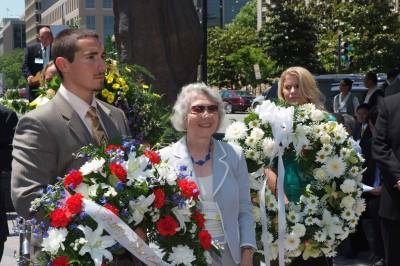 I had the honor of presenting the Crimean Tatar wreath in person. We are grateful to the Victims of Communism Memorial Foundation for providing a platform where we can link to other people of different national, ethnic, religious or cultural backgrounds, who were victimized by Communist authorities. Together we can support the Foundation and work toward the common goal of educating the public about Communism's crimes against humanity. For further information about the Memorial, see the Victims of Communism Memorial Foundation Web site (News Center and Photo Gallery).